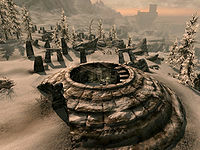 Snow Veil Sanctum is a medium-sized Nordic ruin north-northeast of Windhelm containing draugr. It contains two zones, Snow Veil Catacombs and Snow Veil Sanctum. It is locked and inaccessible prior to the related quest Speaking With Silence, during which it is the hideout of Karliah, a supposed murderer and betrayer of the Thieves Guild. It is full of leveled draugr, and at least one undead boss. The second zone contains a word wall for the Disarm dragon shout, making the related quest and its five prerequisite quests necessary to unlock all three words of Disarm. During the related quest, there will be a tent, two bed rolls and Karliah's dead horse to the south. Several random items can be found on the dead horse including potions and poisons. Mercer Frey will be in front of the barrow entrance and will initiate conversation as you approach including confirming he was the one who killed her horse to stop her escaping. Only Mercer can unlock the door into the ruin, and followers are unable to enter. There are two barrels of ingredients and two food sacks to the left of the entrance as well as blood splatters on the ground in front.. There is an alternative entrance to the northwest, but the way is blocked by an impassable gate until you've completely gone through the ruin from the main entrance. The interior of this ruin is filled with traps set by Karliah for Mercer Frey as well as the normal traps found in typical barrows, including bone chimes to wake the draugr she also left for you to deal with. Upon entering, as with many other ruins, you'll be at the top of a set of narrow stairs. At the bottom of the stairs is a cluster of Nordic Barnacles and an iron helmet on the ground. Continue through the first room and down a further flight of stairs to a room containing two urns, two burial urns, a dead draugr, a pull chain, an unlocked chest, and two ominous upright sarcophagi. Opening the chest trigger the sarcophagi to burst open and draugr to attack. There are two gates in the corners of the north wall and a chain on the south wall operates them, however the right-hand gate has a cave-in behind it and won't open. Behind the left-hand gate is an alcove with a random potion of healing, one of stamina and a small coin purse on a set of shelves. A doorway to the east descends to the next room. This room contains several more sarcophagi, all of which are already open with draugr inside. One of these is leveled and only slumbering, who will only wake if you attack it. There are three more dead draugr lying on the ground and a woodcutter's axe in front of a gate in the south wall. There is a chain to the right that opens it, but also triggers a spike wall to the right. To avoid the spikes immediately jump back once you pull the chain. Follow the passage as it takes a couple of turns before reaching a typical catacomb area with upright alcoves and many burial urns, many of the alcoves contain slumbering leveled draugr. There is an adept locked iron door with a small alcove behind containing a sideboard with a random potion of healing, two of magicka and one of stamina on top and an ancient Nord sword and an ancient Nord war axe on the shelf underneath. There are three bear traps on the ground in the next section and a draugr patrols the next corridor. 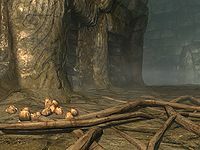 A total of eight draugr are in this area, many leveled with several tripwires that trigger an oil lantern to fall to the ground and ignite an oil slick, causing an explosion. A chest lies against the east wall, among some rubble and to the south is a lowered gate, the chain that opens it is to the left. Beyond the gate are stairs leading down and a passage with two draugr on guard that passes a short passage on the left, to a room and ends at an apprentice locked door ahead. There is a flute laying on the ground and three loose septims. Behind the door is a small room containing three large urns, three burial urns on a stone table, an unlocked chest and empty set of shelves. There is also a barred opening acting as a window into a two-level room further ahead in the ruins with several leveled draugr and skeevers wandering in and out of view. It is advisable to use range attacks from here to avoid a potentially difficult fight later. 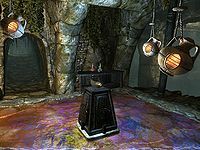 The passage on the left leads into a room with many bone chimes hanging from the ceiling and around the room are five upright sarcophagi, up to four of which contain slumbering leveled draugr. There is a sideboard to the southeast with the Sneak skill book Three Thieves and three random potions on top; one healing, one magicka and one stamina. To the east is a closed gate with a chain to the right to open it. The passage behind it descends several flights of stairs and takes a couple of turns before entering the room seen from the window. As you get close to entering, one of the sarcophagi in the room will burst open and a magic-using draugr will emerge. There are stone stairs to the right and wooden stairs in front leading up to two balcony areas. Taking the wooden stairs leads up to a balcony with two sarcophagi; one open, containing a dead draugr, and a set of shelves by the other which holds nothing but clutter. Between the two is a passage with a leveled draugr patrolling up and down. The passage eventually leads to a third balcony in the main room with a trapped pedestal with the Model Ship on top that can be sold to Delvin as part of The Litany of Larceny quest. It is surrounded by an oil slick and has an oil lantern hanging above that is dropped when you remove the model. There is a potion of healing, potion of magicka, potion of stamina, an ancient Nord sword, several ruined books and two burial urns on sideboards around this balcony that may get blown anywhere if the trap is triggered before you collect them. To avoid damage, leap off the balcony back to the bottom of the room as soon as you take it. The stone stairs lead to a balcony with two large urns flanking a passage heading south. This then turns completely around to the north as it climbs. At the end it leads out onto a covered walkway that passes high over the main room below. By a pillar where the walkway turns is a salt pile on the ground by an animal skull. The walkway continues to an iron door that opens into the second zone Snow Veil Sanctum. The Sanctum starts out with more catacombs with the dead laid out in alcoves along the walls, some of these are slumbering as before. There are two on the left and one opposite on the right. Sneak attacking any of these is likely to alert all three. There is a Nordic barnacle cluster on the ground just before them. Around the corner, stairs descend to an area with two chests opposite each other; one unlocked and the other adept locked with a string of bone chimes across in front of them, and a total of five leveled draugr in alcoves on both sides. Again, this can be a difficult fight for the unwary or unprepared. Once these have all been dealt with, at the end of the room is another lowered gate with the chain to open it on the left. This leads to a brightly lit area with a pressure plate that is easily missed beneath pottery, that triggers a poison dart trap. Around the corner, a narrow passage leads to another leveled draugr and stairs leading up. On the right, at the bottom of the stairs is a burnt corpse, with a second burnt corpse at the top lying beside a dead draugr in the middle of the passage. Behind these are a pair of open double doors with a wide passage behind. At the end is a pair of closed double iron doors. As you approach, Mercer will warn you to be ready as the door is perfect for hiding an ambush. Opening the door causes two draugr (one of them a boss; at higher levels it may be a dragon priest) to awaken and burst from their sarcophagi on a raised area in front of you. There is also a sarcophagus at either end of the room containing a draugr that will burst open and attack if you get too close or make too much noise. At the rear of the room behind the central raised section is the word wall which teaches a word from the Disarm dragon shout. There are wooden stairs leading up to the raised section both in front and behind it, with a stone table to the left of the front stairs with a copy of the Light Armor skill book Ice and Chitin on top. There is also an unlocked boss level chest on the raised section. To the east is another lowered gate with the chain to the right. The passage leads around to a short passage with several bear traps along it and a puzzle door at the far end. Mercer will take over and start talking while opening it. This is the only puzzle door in the game without the corresponding dragon claw to open it with. Once the door is opened a cut-scene plays. Should you return after the events of Speaking with Silence, you can traverse the ruin again. The final room is a series of terraces up to an upright sarcophagus with a lowered gate behind it and the chain to operate it to the right. Behind this is a short passage to an iron door leading outside via the alternative exit. The only thing in the final room after the quest will be a skeleton on the floor that you can loot for a few septims. Outside, the alternative exit is covered with two barrels of ingredients and a food sack. It is located west of the main entrance midway between the main entrance and Whistling Mine. Even after finishing the quest, followers will not join you inside. There is a stone platform west-northwest of the entrance to the Sanctum with an inaccessible grate-covered well in the center of it. Two ice wraiths will periodically spawn here, and can often be seen fighting with a frost troll that spawns nearby. Setting off the oil lantern traps in the room with the Model Ship before picking it up can cause it to be blown off of its pedestal and potentially difficult to find again. This page was last modified on 16 July 2018, at 22:04.